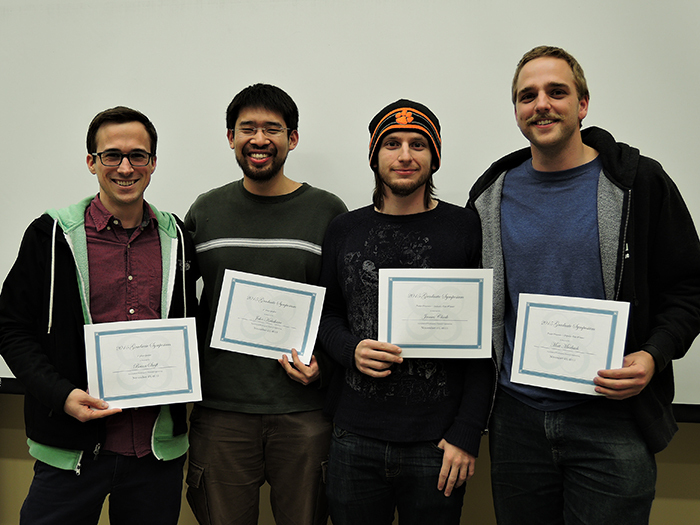 One of the highlights of 2015 was our annual Graduate Student Awards Day held on November 23 to honor the outstanding achievements of our graduate students in several areas. 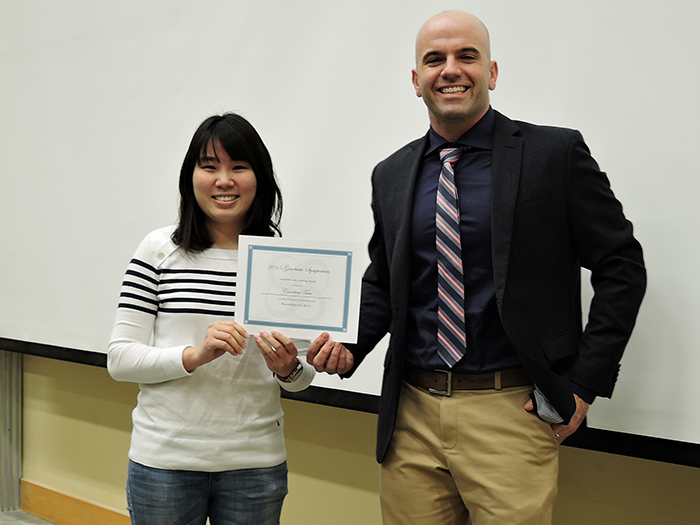 Caroline Tsao was honored with the Jane and Joseph McCarthy Award for Excellence in Chemical Engineering Graduate Student Teaching. Dr. McCarthy wished to reward graduate students who show excellence in teaching, and the award selection process relies on undergraduate students to choose the recipient. Caroline was this year's overwhelming favorite. Among other comments, one student said this: "Caroline's enthusiasm, patience and overall positive approaches make her so unique. Every time I left her office, not only did I understand the problems better, but I also gained more confidence as a student." Fang Sun won the High Impact Publication Award. 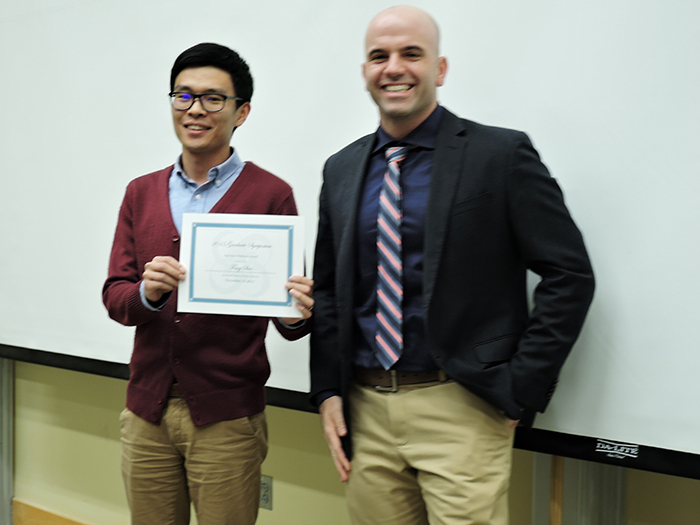 This award recognizes his paper entitled "Sensitive and Fast Detection of Fructose in Complex Media via Symmetry Breaking and Signal Amplification Using Surface-Enhanced Raman Spectroscopy," which was published March 4th, 2014 in Analytical Chemistry. Fang works in the Jiang group, which collaborated with the Yu group to produce this paper. Prof. Qiuming Yu stated that the paper "demonstrated a new concept that enables the sensitive and specific detection of analysis with small Raman scattering cross-section via the change of probe molecule's Raman spectral change and offers a new chemical/biological sensing method without labeling and the use of ligands." 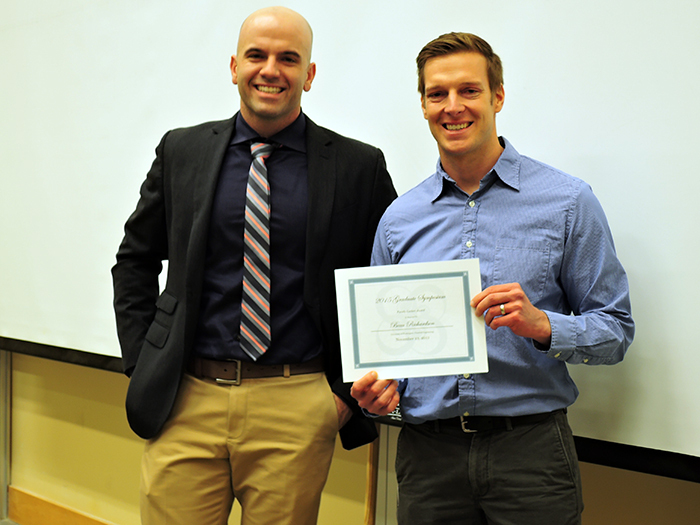 The Faculty Lecture Award went to recent graduate and current postdoctoral fellow Beau Richardson. This award comes out of Beau's work in Dr. Yu's group developing the technology of conformable solar fabrics for commercialization. In addition to that research, Beau also conducted research on photovoltaics that has led to two papers he published as first author, three more as co-author, three more papers that will be submitted for publication and presentations at the AIChE and MRS conferences. He also received a CoMotion Graduate Innovation Award in 2015, and filed a patent regarding his work. Currently, Beau is developing a new nanofabrication technique for scale-up, analyzing potential markets to refine a business plan and evaluating potential advantages and competitiveness with other PV solutions.